According to CREA, the national number of sales rose 3.9 per cent month over month, and 2.6 per cent from November 2016 – the fourth month in a row to see gains, but the first time since March that activity has been stronger than last year’s levels. This is mainly due to the downturn witnessed in the Toronto real estate market and throughout the Greater Golden Horseshoe following the implementation of the Ontario Fair Housing Plan in April. However, it was a slight recovery in these markets that has fueled national November growth, with an increase of 16 per cent in Greater Toronto accounting for two thirds of all sales. The MLS Home Price Index rose 9.3 per cent from 2016, while the average sale price increased 2.9 per cent to $504,000. Excluding Toronto and Vancouver would strip out over $120,000, to $381,000. However, Canadians shouldn’t get used to this uptick in sales activity, as much of it may be due to buyers rushing into the market to get ahead of the Guideline B-20 rules that will take effect on January 1st. Experts say these rules, which will stress test all new mortgage applicants, will reduce affordability for the average buyer by 20 per cent. CREA President Andrew Peck believes this has led to temporary buyer urgency during what is usually a seasonally slower time for real estate, as buyers snap up Toronto townhouses, condos and detached homes before seeing their affordability slashed. 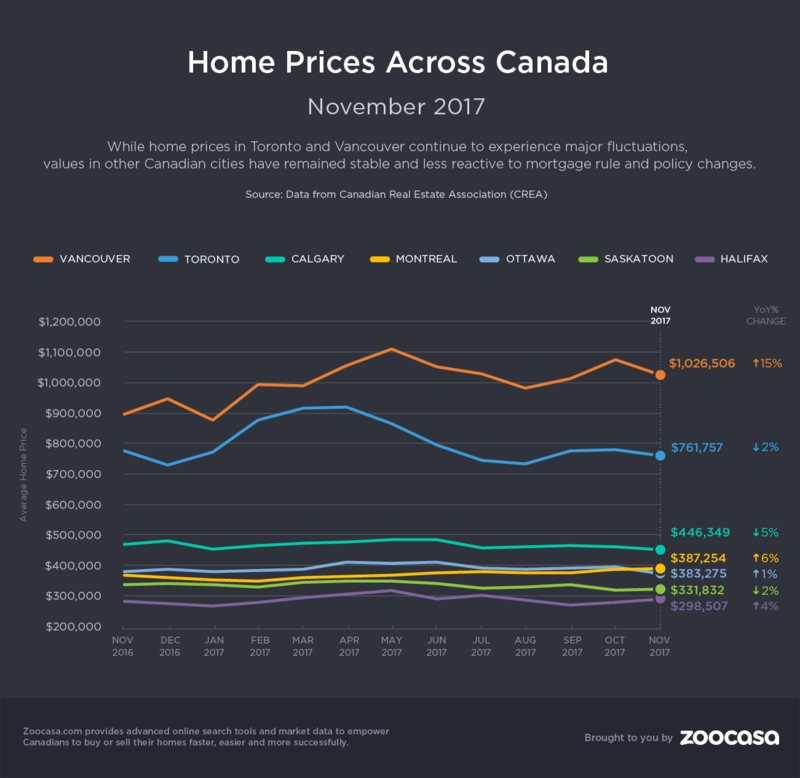 This buyer anxiety appears to be concentrated in Canada’s largest markets – in an INFOGRAPHIC compiled by Zoocasa, it’s clear other major centres are experiencing steady activity throughout the autumn season, compared to strong upticks in the Toronto and Vancouver markets.